Content marketing strategist Kyle Gray is back with James Schramko to talk more about content - what makes it good, and how it can be easier to create. 06:39 – Why pick a fight? 35:51 – Can you skip content marketing? James: James Schramko here from SuperFastBusiness.com. Welcome back. This is part two of a special series with my friend Kyle Gray who is an entrepreneur who helps startups and small businesses grow especially around content marketing. In our part one, which is the episode prior to this, we talked about how you go about making content creation a little less challenging, a little less intimidating, and we covered some really epic points. I encourage you, please go back and listen to episode one if you’ve just arrived at this post because this episode is going to continue to build on what we talked about before. In the last episode, just for a quick highlight, we talked about content strategy, we talked about style guides, we talked about key relationships and influencers, building a keyword bank, leveraging your own story. We had a bit of banter about two perspectives. How we’ve leveraged our content flow a little bit. We talked about stories and some things that you must do and a couple of content marketing mistakes that you shouldn’t do. So I encourage you, please go back and listen to that. We also published a guide called 9 Tips for Easier, Better Content Marketing, which you can go and download from part one. So go and grab that. In that guide, we talk about some of the tips that are going to help you make way better content and build more empathy with your audience and get right into the zone of where your customer wants you to be. So with that mention, I’d love to welcome back Kyle Gray to the episode. Kyle: Thanks so much for having me again, James. I’m excited to be back. James: Well, you’re pretty much back because we had plenty of things to talk about in part one, and we didn’t finish our list of ideal topics to cover. So today, we’re going to cover some extra topics. We’re going to talk about the blog’s purpose and how we can stand out from every other blog. We’re going to use some examples in that section. We’ll also talk about beyond just getting traffic for your content and how we can use it to build relationships. We’ll also continue on that journey of how we can make our content load a bit easier because one frustration that comes up from content marketers is they just sit there with that blank screen and trying to create the stuff and then get it out to the internet is just too overwhelming. So we’re going to smash through that and then we’ll talk about what if you’re not even good at writing content. Hint: like me. So with that said, let’s dig straight through to how we’re defining a blog’s purpose and making it unique in the noisy world. Kyle: Definitely. So this goes in to kind of the early stages of what do we want to set up for our content strategy. I wanted to dig a little bit deeper into the section because I think that differentiation is one of the most important things that you can really plan in the early stages of your strategy. If you’re going to sound like everybody else, it’s going to be really difficult to compete. But fortunately, there’s a couple of really, really good ways that a lot of people can leverage to bring out their unique flavor of their blog. So again, the most fundamental differentiator that anyone has is their own story and looking back on their own experiences, on their own perspectives. We talked about that a lot in the last episode. But it’s just really a great place to think about the challenges and the setbacks that you faced to really put your business together or why you’re even in the business you are in, in the first place. There’s definitely a story behind there. And just knowing that about yourself is going to help connect you a little bit more with the purpose and find a way that you can take a little bit of a different perspective than what’s currently out there. James: So we hear a lot about that point of differentiation, unique selling proposition. So POD, USP, be different. Everyone else’s take and all of that stuff. But is there a process we can use to figure out how we’re different or what sets us apart from everyone else beyond just looking at our own story? What if someone else has a similar story? For example, if you go to watch people speak at a selling event or a pitch fest, you’ll find out that most of them at one point were dead broke, were maxed out on a credit card and were probably sleeping in their car or on a park bench. It seems to be a recurring theme. Kyle: Yeah. So one good way is to, for example, envision yourself as a reader of your blog, envision yourself at the park bench in that lowest moment. And then decide, if you could create a blog for yourself at that moment and supply yourself with all the information you needed to get the results you wanted, what would you discuss? What would you write about then? 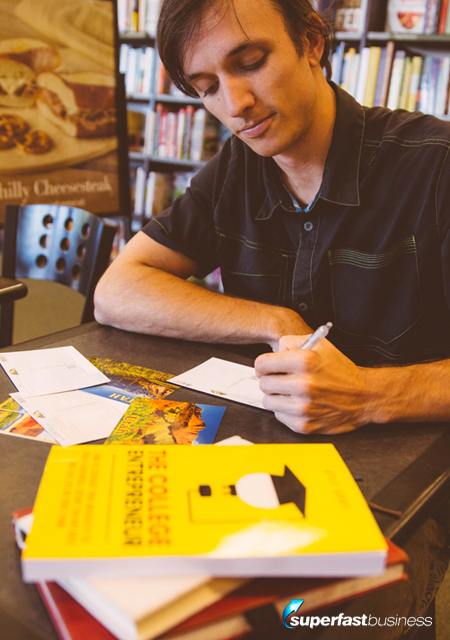 How could you write letters to your past self and visualize yourself from the bottom-of-the-barrel park bench moment up until your fulfilled self? Where are you going to focus? What are you really going to discuss in there and how is that going to change your past self into the successful person you want to be? That’s just an excellent way. If you have this great turnaround story, it may sound very similar to a lot of people, but there is a certain group of people that need to hear it your way, that relate to you in a different way than others. So just creating a strategy or a way to look back on yourself and help yourself through those times is a great place to start. Another one that I really enjoy that I think does really, really well, and I have some good examples of this is pick a fight. A lot of blogs or a lot of marketers will do really well when they choose something to stand against. It’s usually kind of a sacred cow in whatever industry you’re in. So for example, Dan Norris did really well with a blog post called Startup Validation Bull****, where he had his business Informally, Software As A Service going through the lean startup validation and as far as lean startup goes, his business Informally was checking off all of the boxes for super hit startup. But still, he launched and didn’t get those results. And so then came WP Curve after that, and he was able to launch a successful startup rapidly in seven days disregarding almost all of the lean startup methodologies and philosophies. That resonated with a lot of people because even though the lean startup is an excellent model, very useful idea and strategy and has helped a lot of people, it’s not a perfect solution. It doesn’t perfectly fit. Even it doesn’t work for just 25 percent of the people out there, that’s a huge slice of pie that if you just define yourself and pick that fight, then you can start to differentiate yourself, start to stand out and start attracting a lot of attention. Another good example is a company I’m working with right now, Advance Your Reach. They help speakers get on stages, speak at conferences and use that as a way to grow their business. And right now, a lot of people who are offering similar training out there are saying get paid to speak, get paid to speak. But that philosophy, though very attractive upfront of ‘Yeah, I want to get paid thousands of dollars to speak on a stage,’ it sounds like an awesome, rockstar kind of idea. But it’s kind of shortsighted at first. If you have a business that can benefit from speaking on stage and that you can maybe develop $20,000 in customer revenue, then getting $2,000 to speak on a stage wouldn’t necessarily be that big of a deal either way. But if you’re so focused on speaking on stage, you might turn down a free stage where you could earn a lot of money by being in front of the right audience for a paid opportunity that doesn’t really generate anything for you in the long run. So these guys focus on a holistic, develop-your-business in a way so that you can speak on stages and grow in the long term and not have to only get the speaking opportunities that you can get paid for and not have to be a road warrior. You can pick out a couple of good events that you want to speak at and grow your business that way without having to spend every weekend away from the family speaking at different conferences. James: Nice. You combined a couple of good points there. Pick a fight. It kind of lends itself to the elements of Warren Blair’s persuasion techniques, which one of them was to fight the common enemy, and you can sort of extend that to fight the common enemy within, which is kind of back to the park-bench thing. I think maybe you didn’t quite answer the question the way I was hoping. So I want to go back to that. A lot of people choose the bankrupt, desperate, car crash, there’s a famous guy who does the car crash all the time, crocodile tears and everything on stage. Hugely manipulative. If you like, my pick-a-fight thing is against that really pedestrian approach. It’s so manipulative and effective because it picks up anyone who’s in that place along the way through. Maybe they’re not that bad off to start with, but if they can show that they were even worse off and did well. My problem with that, of course, is I don’t love getting business advice from people who were bankrupts or completely desperate or drug users or were single with no kids. Virtually unrelatable. In my mind, they don’t cut the mustard because they haven’t really proven a success before they created their rise from the ashes. They’ve just made the rise from the ashes the success. So it’s not validated. I really like the examples you gave about going against the industry norms. There are so many myths out there. There’s a huge myth at the moment about funnels, which I think is such a con; and tripwires, and product launches, and workaholism, and VC startups. I think at least I found my position by being real and bringing actual business information to business owners who want to sidestep all those grenades. But what else can we use in our armory if we’re going to throw out the most common one, which is the once-I-was-lost-now-I-am-found story. There’s got to be other stories we can use. Kyle: There certainly is. I think depending on the size of your business, a business with a few different team members can actually benefit from a couple of different sources of stories that could be useful for differentiation. For example, if the rest of your team members, even if they’re not writers, even if they’re not marketers, understand kind of the purpose and the goal of what you’re doing with your content marketing, you can have your team always on the lookout for different stories within their own work. Say somebody on your customer service team has a really interesting call with a customer, maybe the customer starts out very, very angry or upset at first but then realizes that they just were using whatever software tool you have wrong or weren’t downloading the files properly, whatever example may be. But the customer service operator turns it around into this really big success and it’s a happy person. There’s a resource in there. There’s a story in there. And if they are able to share that or to get that to you in a way that you can share that with other people, this is especially good for business-to-business companies because everybody in business to business is always wanting to look inside and behind the scenes on how everybody else is handling things because like you said, there’s this kind of myth out there or a lot of survivorship bias where everybody kind of talking upfront seem like they know what to do and they have this perfect system. But really behind the scenes, everybody’s not quite sure exactly what’s right, where can I tune my business a little bit better? What steps can I take? And so just sharing little stories here and there about, ‘Oh, our customer service rep got this incredible result with this unexpected conversation here,’ or, ‘Our developer figured out how to solve this different problem,’ or, ‘I learned how to take some of the lessons I learned from my business life and apply them to my home life in an interesting way.’ There’s lots of different ways you can tap your team and just the small stories that are happening every day inside of your team to differentiate what you’re doing and to attract unique attention. James: Where do we stand with regards to customer’s success stories and also guest stories? For example, you’re a guest on my show and we’re talking about your stories, which are really defining and shaping the kind of content we’re producing at SuperFastBusiness. I like to publish real information from real people who have actual experience because I guess I’m fed up with what’s happening in the marketplace. And that is, it appears if someone’s a little bit outgoing and they have a nice smile and they’re prepared to do Facebook live videos about every airport they ever visit, every car they ever rented, and every luxury villa that they stayed at, then they could create a huge following in the online business space. I just think that it is a con because a lot of them don’t really have much to substantiate behind the scenes. They’re just utilizing their natural charisma and their willingness to compromise their life by having absolutely no boundary between privacy and business, and that’s their choice. I’m just saying it’s not my choice. It’s purely my opinion that it’s actually kind of sad. Some of these people, they’ve gone to the point of wearing their t-shirt and tattooing their brand on themselves like they’ve crossed the line between preserving a life outside of being a complete and utter sellout. Kyle: Yeah. I think for customer stories, I think that that’s one really good way to, there’s a good balance that needs to be kept because if you’re just kind of using, how you use your customers’ stories is very important. If you just use it as a way to further self promote, then it’s just a glorified testimonial. And I think if you use exclusively those like, ‘We helped customer X do so much better,’ if that’s all you’re putting out, then people aren’t really going to engage with your content for very long. A lot of people just see that as self-promotional. But if you can find a way to actually make the customer’s story more than just, ‘Hey, look at this awesome work we did,’ but by kind of distilling it into a valuable lessoning, a lesson, and again, seeing how this customer’s story could impact somebody and actually solve a problem without the reader having to buy your service or purchase your one, quick trick tripwire, then you’re starting to get on the right track with that. Other guest’s stories, I think, are also crucially important for that. I think if you’re a good content marketer, somebody who’s comfortable with their business and their brand and the voice and the message they want to tell should be comfortable with sharing other stories from people, maybe who are in a similar industry or position to them and maybe serve a very similar audience or compete with them but can still hear them out, showcase them and make them look like good rock stars if it’s going to benefit your audience in the long run. I think it shows that you can build trust within your own industry, and it shows that you can be trusted to know what you’re talking about even if you have somebody else, again that’s a competitor, if you can identify what they’re doing well and showcase that, then it just shows that you have good taste, and you know what you’re doing, and your audience will see that and believe that. James: And another foundation can be our origin story. If we have a product or there’s some unusual thing that happened, and something that comes to mind as an example is this chap that I was having dinner with, I was at an e-commerce event of Ezra Firestone in San Diego, and after the event finished, we went down to a local restaurant and this guy beside me was telling me about how he was riding his motorbike around the back villages of Bali and he found some villagers who were making carvings from bone, and he asked them to make an infinity sign, and they were able to make it. And then his friends were asking for custom jewelry and then he actually got this business to the point where he employs over a hundred villagers full-time, and they’re selling these bone carvings from a site called Wanderer Bracelets. Ben Katzaman has such a great story around this, but when you wear the jewelry, or even when I was visiting Bali recently, I just remembered how this whole village is supported by people on the internet buying the products that were discovered by a random motorcycle trip. That story is appealing because it’s got a lot of cause value. You can feel good about buying the jewelry because you know that somebody is having a better opportunity than they were going to have through the traditional methods. And the traditional methods are pretty much relying on tourist vans stumbling across the village and making very small scale purchases. To be able to support a hundred people is a great thing. I actually found that as an accident. When we were running the SEO business, at one point, we hired over 60 people in our business. It just felt good. No matter what our product or service was, as long as the product or service was ethical and good value for customers, which it was and still is, because I sold both of those business units and they’re flourishing, the ability to support those people, it’s just like this whole value creation mechanism. You get to create value for 60 team members who are more or less supporting up to five or six family members per household. So that’s really leveraged. You got 250 people you’re supporting through this idea that turned into a domain name that then went out to the world to create value. And then you’ve got the resellers who are getting huge value from this whole sell service. And then you’ve got their retail customers who are getting huge value from their resellers, and the world is a better place for that. But it felt good having that cause behind it rather than just the typical marketing thing, which is mortgage is due, need to make money, what can I sell to people, and there’s very little regard for any value creation. There’s very little regard for a sustainable business beyond the next few days or weeks. There’s very little regard for values or ethics. They’ll promote pretty much anything. Or in the case, especially in the online space, people will just tend to make stuff up, which is outrageous, but still highly unregulated. So I guess if you’re not making stuff up, if you do have a value creation method, if you have a sustained business that’s been ticking along for a while, that’s probably worth some currency in your content marketing. Kyle: I think so. And that goes back into the problem that I talked about in our last conversation where content marketing is straddling these two different worlds, this very artistic, creative world and then this very metrics driven digital marketing world. I think a lot of people, when they’re ready to create something, similar to how a lot of controversy are around news articles being published right now, but people are just looking to make the most appealing, clickable headline out there and just get that kind of sugar rush result and get those early conversions or make a short term profit without any real care on the value that they’re making. I’m seeing a lot of trends not just in online marketing but just kind of in business in general. In the United States right now, there’s a lot of companies that, there’s this new classification called the B corp, which is a purpose-driven company, in so many ways that it’s a corporation that does not have shareholder value at the top of their list. There’s somebody I know here in Utah who’s kind of become a thought leader around this actual organization, and I’m begging her to start making blogs about it because I think it will be incredible. So if you’re just so focused on getting those conversions, driving traffic, getting those clickthroughs then you’ll probably end up shortchanging the value creation that you can add. But if you can find a purpose just like what your friend on his motorcycle trip did where it’s not just helping the customer but you’re actually making the world a better place, connecting with something like that, there’s so many great ways that he’s doing it with a product, you can do it with content or you can tell the story of how you are adding value to the world through that content, I think it would be interesting to hear some of the stories from some of those villagers and some of those people who are creating those things now and seeing what’s been changed because there’s a huge desire right now for causes, for purpose, for just feeling like you make the world a better place with who you shop with and who you work with and what ideas and content you consume. James: Well on a related note, that story of how I met Ben at dinner, and he was telling me this story, I said to him, “This is a great story. Would you share it with my audience?” I invited him to come and speak at SuperFastBusiness Live, which was in March 2017. He accepted. He’d actually come to the one before. So he was already popping over from Bali to Sydney for the event. He got tremendous value from it, he agreed to come along and speak at it. We also did a podcast. His story was really popular with our audience members as well, especially because some of them have e-commerce stores. I think it brought an authenticity. He’s also very young. So it was a good example of how you harness a raw desire to do good things with that savvy business e-commerce stuff. He’s getting some training from Ezra Firestone. So he’s been tuning up the e-commerce site very successfully. It’s a remarkable story, really. So that was a case of getting this content from someone in the field doing great stuff, certainly in an area where I’m not. I don’t do e-commerce or physical goods. Especially, I’m not in the jewelry market. So getting that content was useful. It helped me have that relationship with Ezra and speaking at Ezra’s event to meet more people. So by bringing him into my community, it really resonated with the e-commerce audience. I guess it lifted our whole product offering. We have the recording of that, which is available for members of our community. We have the free podcast for people to sort of walk into that and get a feel for it. How do you use content marketing to build authority and relationships? Because we know from the examples I gave before, some of these people have built quite a following, like the Pied Piper, just through their willingness to turn on a Facebook live video or to publish content with a nice smile and a few tears here and there, you can really tug the heartstrings. So how do we collaborate with other people to build that authority? Kyle: Yeah. You’ve already given a couple of great examples or through story, but yeah, I’d like to break those down and add a few more. Really, this is what gets me excited about content marketing is I love creating, I love adding value to the audience, I love building up a brand this way, but when I’m really excited is when I have the opportunity to collaborate with somebody, to meet somebody new, or to just feature somebody on some content I’m creating. I think that this is such an essential and important skill for a content marketer to have, especially in the early stages of a brand and in early stages of a company. But these skills are foundational to getting momentum early and maintaining momentum for a very long time and increasing your momentum. But what I would do when starting out with content along with weaving in your own story and finding a way to differentiate yourself is to find other people, other thought leaders in your space and start featuring them, quoting them, I really like to create or find nice-looking images of them and put quotes of their work on the images that are just really shareable on social media. Just whatever you can do, whenever you interact with somebody, make them look like a rock star. That sounds exactly what you did with the jewelry company, which ended up, they looked like a rock star for you, attracted more attention, and you just showed us how it gets paid back in strange and unexpected ways. James: Yeah. For one thing, I’ve got a nice wooden carving bracelet here on my desk. That was unexpected. Ben actually took it off his wrist and gave it to me at lunch at our Mastermind. To go from an Italian restaurant in San Diego to six months later receiving a hand-carved bone jewelry wristband at Manly. It’s like it’s such a bizarre world, this online thing, when you actually, physically meet people and take relationships behind the scenes to the next stage. I ended up just kind of serendipitously hearing his name at an event and meeting him there and now because of that, we’ve become friends. We chat a lot. We help each other on our speaking opportunities and on our own businesses. It all planted the seeds with content. But yeah, there’s lot of other ways other than just featuring a single person or quoting somebody on a post. One of my favorite ones is the roundup post, and this is a very common strategy where you get around anywhere from five up to 15, or some people go way crazy and get hundreds and hundreds of people, but just collecting a bunch of different opinions or a bunch of different quotes from people on a specific topic, on a specific idea is a very powerful way to, again, plant those early seeds of collaboration through content marketing. A lot of people get this wrong because they’ll send out a big email blast with a couple of lines like, ‘Hey, I’d like to feature you. Can you answer this question?’ Maybe they’ll get like a one-sentence response from somebody they feature and then they just throw up a bunch of naked quotes onto a blog post just from a bunch of different people. It doesn’t look very good. It’s really just like a collection of tweets or something that’s trying to pose as a blog post. I think those don’t end up getting the really good results that you’re looking for. And so not only, going back to making the people look like rock stars, the people that you feature, try to ask them really good questions. Give them something that they can write more than just a sentence response to. And if they do write a paragraph or two, make them look good. Give them a nice quote image that they can share the post with. Also, weave the different quotes into a bigger narrative. If this is something that’s interesting enough of a topic that you’re getting responses from several different influencers, there’s probably a theme around here. Kyle: [laughs] Oh yeah. Well perhaps they were one of the no-kids founders you were mentioning earlier. James: It always cracks me up, the life advice of a 20-something year old espousing the ideal way, like when you’re knee-deep in nappies with a screaming kid, you’ve got to pay for the next 20 years. Life is very, very different and completely unrelatable to this guy sipping his red wine, doing Karate lessons and travelling the world. Like what planet is he on? Wake up! Only when you go down that path will you have an appreciation for just how hard parenting can be on a human. It’s just next-level stuff. I would offer them full authorship if they were interested or co-authorship. But just to have somebody else’s name on that post that they’re excited to share, even with the small amount of work upfront that they needed to do, it’s totally worthwhile. And this plants the seed again to start opening the doors for new opportunities, for the speaking opportunities to introduce them to other people. And that’s really what starts to get your blog that early momentum, because I don’t think you should expect it from search engine optimization unless you have a boatload of money to start out with. But I still think you could spend this money in better ways. You couldn’t do it with Facebook ads. Just kind of blasting traffic to your different pages without really knowing what you want from it. James: Well, this is such a huge topic of where the investment of your marketing will go. The stunning reality is that you could skip the whole content marketing thing altogether if you want. If you can just use your email to the right person with the right offer, which a lot of my most successful students do, you don’t even need a website, you don’t need a domain, you don’t need much except for an offer that converts to someone who has a pain, who recognizes what a better result would look like, who trusts you and that you can get in front of them. The best piece of content to offer them is something like a case study or a white paper demonstrating that you are a proven authority and established and that they can go forward with that. I’ve been teaching this in my own community. I’ve got a few experts in my community who do teach this to their own communities, especially Dean Jackson and John Logar. They’re not going to be investing a whole lot in that front end if they don’t need to. But then if you get something that converts like that, building content around it will leverage it. Building ads to drive people to get onto your email list will give you more people to send that email to, and of course the next level of stuff, doing SEO, fine tuning and optimizing your site to get even more traffic, which is what we do around our podcasts, that’s why we fully transcribe them, like 100 percent of our podcast, SuperFastBusiness, are word-for-word transcribed, and we get an enormous amount of SEO traffic, bringing people to this podcast. And we’re in a relaxed pace here. We’re not in a screaming hurry for people to join SuperFastBusiness membership. But most of our key audience members who really recognize that they’re ready to go to that next stage will eventually find their way onto the waiting list, and they’ll eventually be offered the ability to join the membership. And so I’m on a slower process than some of my friends who can generate sales today. And I get people who actually make that decision after three, four, five years. So that’s what I call a low-pressure environment. It’s like a diesel locomotive versus a high-boost turbo-charged racing engine, which a lot of people seem to want to build, where they’re obsessed about driving traffic. Now, the thing I liked about your co-author post is that it’s a lot like a movie approach where you write the script with an actor in mind who can bring their name and fame to the show and turn it into something epic. You write it in mind for a Harrison Ford or a Robert de Niro who can just step in and bring their name to the show and bring it to life, whereas like a nerdy writer who’s not famous, he’s not going to get that same exposure with no-named actors. So you’re looking for someone with existing audience and pull in the market to come along and to waltz into your content trap, I suppose, and to bring it to life with you. That’s what gets the fire started, and once it’s started, it’s easier to keep going, right? Kyle: Definitely. I think the hardest area, the hardest moment is that first kind of few months of silence that you get when you’re starting out with content where you’re just publishing and you’re not getting a lot of response. You’re not getting a lot of traction so far and you’re still trying to find your vein and really get people to start paying consistent attention. And by having that extra influencer, that extra star appeal and a couple of good blog posts early on can be the thing that gets the engine to turn over, can be the thing that captures that first little bit of search engine traffic that you can really start your snowball effect around. James: Well, I want to talk to you about the topic of how a busy person can actually get going with this content. Let’s say that if someone’s listened up to this point, they’ve invested quite a lot of time in the topic of content marketing and it’s a valuable thing to be doing, and I’m just again using the case study of my own website, SuperFastBusiness, is fueled from podcasts and the resulting publishing of those podcasts and SEO traffic and some social syndication that we get, and broadcasting our email and so forth. It all pins around this idea that either I talk or I get someone to come along and co-host with me as we’re doing now, on topics that actually matter. How can we get a quick start on the workload and get these things going? And then I want to run a wild idea past you and just get your immediate reaction, unedited, to see what your thoughts are. If it’s crazy or if it’s a good idea. I finished up a six-year podcast that I’ve been running called Freedom Ocean with Timbo Reid. It was an amazing show. It’s been probably consistently the highest-ranked podcast I’ve had, and it was just foundational for generating members for my community, and our members grew up. And in the last episode, we talked about why the show stopped and what changed, and it all made sense. We had a great reaction from that. But my wild idea is this: is to revisit from episode one and to have a quick listen to each of the episodes, make some notes, and to then on SuperFastBusiness provide like a new version of that topic. If the topic back then was affiliate marketing, you know from five years ago or six years ago, we talked about what was happening then, I want to do like a Freedom Ocean update from episode six, way back six years ago, what does it look now in the current environment? It’s like a redo. And I imagine it will only take me about 25 minutes to summarize a Freedom Ocean topic, because Tim and I used to banter a lot. And if it’s just me doing this and updating it, my idea is that like all the ideas are already done. So every episode is already done. So the idea for the episode is done. My workload is just to review the content, which I can read or listen to. Then I’m sure my audience who have grown up with the show are very interested in what’s changed. And then a new listener who’s sort of finding Freedom Ocean, and they happen all the time, it gets a lot of downloads, can then jump across to SuperFastBusiness and see what’s happening now and get up to speed. So that was just my wild idea. What are your thoughts? And maybe, I’ve seen a lot of different call-in kind of apps out there where somebody could call in and leave a response and this could turn into somewhat of a roundup post but as a podcast for just taking this old content, updating it, and then bringing in the thoughts, letting your community members shine by sharing their expertise. I think that would open it up for a lot of different, unique perspectives that you might not have yourself and people would be really excited to put in a really well-thought-out answer if they knew that that would give them the chance to be featured on another release of Freedom Ocean or wherever you plan to publish this. That would be one exciting thing. Another way to do it is I would certainly start with the episodes that got the really highest engagement, the most comments, the most downloads, the best guest, the most shares, and start with those to kind of test the waters, because those are the most likely candidates for another second, repurposed, homerun piece of content out there. And so I think that doing a lot of those and seeing or examining why those ones were the best and then seeing if you can add on that and double down on what was making those podcast episodes so great. I think that both of those approaches could breathe a lot of new life into that content. James: Yeah, that’s a good idea. So I could probably take the top 10 or dozen that are going to be the 80:20. They’re going to have the most traction out of the gate. The guest contribution one was interesting, but I’m not that interested in what my guest have to say about those topics. I’m interested in my thoughts on those topics now because it’s comparing the old me to the new me. The fact is, and this might sound terribly harsh, a lot of people have absolutely no idea and that’s why they’re listening to the show. I don’t expect them to have the answers. I’m expected to have the answers. It’s my specialty. I speak to 500 people every week, and I aggregate the very best ideas in my private community. And on top of that, I coach 30 of the highest-level entrepreneurs in our industry. So I’m seeing stuff they don’t see. So it would be unfair to ask them to answer the questions that I should know the answers to. So I don’t think that would work for me on that format. But I think that would work for someone who doesn’t know the answers. If you want to be more the facilitator and bring in the expert opinion of your audience who have more specialty than you do on the topic, then that would be an awesome technique. But I think in this case, I actually do know the answers. The intent for me is to reveal the answers to people who don’t know the answers. Kyle: I see that now, and that makes a lot of sense. James: And that was my role in Freedom Ocean, just for more context. I was the person answering the questions and Tim was the one asking the questions. I guess I’m just asking another round of, does my answer change, what have I learned in the last five or six years or seen? And it’s a lot. My experience level has gone up an enormous amount in six years since we started. The interesting thing when I review my old work, which I do from time to time as far back as 15 or 20 years ago and 10 years ago, I’m often reviewing my old work. A lot of the core things have not changed at all. Especially things like the idea of having a lifetime customer, providing actual value about if you want to be wealthy, you create value for a lot of people. So leverage. A lot of the themes that I learned decades ago still hold true now, and that’s going to come out in the content. And of course no one else is going to be able to answer it because they don’t have all of that context. James: I’m like a completely different person apart from being probably 15 kilograms lighter and a much better surfer, life has changed. So even if something is still the same, that would be worth highlighting because it shows we’re on topic. And if something’s different, it will be useful for someone who’s just discovered the episode to get the abridged, new updated version. And I know as someone who likes consuming content, I love to follow authors through their timeline over the years and see how they change. Like radical examples of that would be an artist like Cat Stevens who sort of later apparently renounced his previous works and changed his name and didn’t want to be associated with it and all that sort of stuff. So it’s funny to see how people reflect upon their old work down the track. That’s my concept. Just to sort of close out here, what are a couple of other techniques we could use to reduce the workload? I’m lucky I’ve got an existing body of work that I can go and diagnose, look for the cherries and polish up and to represent to my audience, which I would enjoy, and I think they would enjoy. What else can we do if we don’t have that? 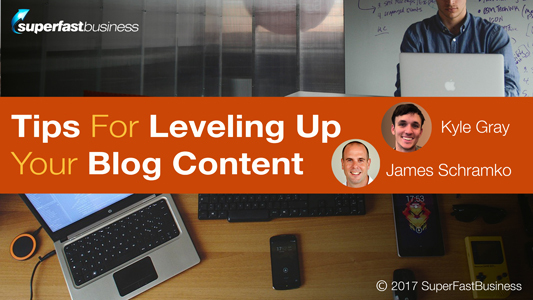 Kyle: So I think that if you spend some time planning out your blog and your content upfront, then you’re going to be able to frontload a lot of the heavy work that happens. Again, on the last episode, I mentioned focusing on core problems, which are maybe four or five problems that you want to address with your audience. They’re not necessarily the same things that you would discuss or the problems that you would solve in your business, but are parallel. If somebody has problem X, then they probably also want to know how to fix problem Y. And so if you can identify four or five of those core problems and then start thinking about these problems, and these problems should be broad enough that you can create content nearly endlessly about them, so these could be things like content marketing, Facebook ads, driving traffic; that’s broad enough but also people understand what they are and if it’s a problem for them or not. And if you can just pick out these problems and just focus on the problem level instead of the individual blog post level, from there, if you have this perspective, you can do a lot of keyword research upfront. You can figure out hundreds of different keywords that you could use on these problems, and just do a bunch of keyword research all in one day and have this big list that you can just draw from good potential keywords for months and months if not years into the future without having to reinvent the wheel every time you open up a browser for a blog post. You can do the same thing with influencers. If you know a certain core problem for your business, then you can go out and find a lot of people who are solving that problem with their content right now, have them listed, do some research on them, figure out where they can or what they’re talking about and how you could incorporate them into your story. Once you have a core problem in mind, it makes it a lot easier to come up with ideas that scale. If you have this kind of factor of, I’m going to focus on just topics related to this problem and just start brainstorming a bunch of ideas, that’s so much better and so much easier than it is just to sit down in front of a blank screen and say, “What am I going to write about today?” You can come up with a bunch of headline ideas, maybe even some abstracts or outlines for the content you’re writing, right upfront, and then if you’re a writer, you can continue to execute on those but if you’re not a writer, if you have keywords picked out, if you have some influencers you want to reference or specific pieces of their content that you want to reference and some of the basic ideas or your stories around your ideas identified, then you have enough pieces of information that you could give those to a writer and have them turn that into some great content for you. James: That’s excellent. And of course, when you see content you like or when you have an idea, it’s good to know that down somewhere I’ve got a little ideas notepad that I just write things down that I can refer back to when I want to create content. I write them into across a page with potential columns that are designed prototyping process of just putting stuff down on paper, letting it sit for a while, brainstorming as many extrapolations as you can, let it sit for a while and then circle the ones that are hotspots based on your analytics and data and what people are asking for. Of course a deep dive survey like the ASK method helps you pull just an enormous spreadsheet of every challenge your customers have ever had, which is fantastic for creating blog posts and content around. And we sort of touched on the previous episode, picking a medium that works for you, whether it’s writing or talking. You can turn that stuff into great content and get your story out there, right Kyle? Kyle: Yeah. I think that that’s one of the better things about content marketing is right now, in this day and age, if you’re not a writer, it’s very easy to find writers who are able to do that work for you. As long as you have the good ideas to provide, you can provide them in whatever medium that works for you, be it video, be it podcasting, infographics or whatever you please. They’re all fairly challenging so you just have to pick out which one you really want to stick with. But the good news is if it’s not writing, almost any content can be repurposed into good writing. So that’s super good news. So there’s always opportunities if you have the right systems to translate your ideas into a well-written blog post. If you understand what kind of post you’re looking for, can define your tone and your voice and giving kind of specific parameters for what you’re looking for in a style guide, you can hand off a recording, you can hand off an image, you can hand off a bunch of things, and just get great content created for you. James: Kyle, it’s been so good having you on the show. You’ve helped create some excellent content with these two episodes. We’ve been talking about how to succeed in content marketing without spending all day writing. We have covered so many topics. We will summarize this episode as well into a handy PDF cheat sheet that can be downloaded from SuperFastBusiness.com. Look for the How to Succeed in Content Marketing episode in the search bar. This is Kyle Gray that I’ve been speaking with. Kyle, you’ve got a book, which you can get, thestoryengine.co is your website. Good luck with that. Kyle: Thank you so much. Yeah, it’s got lots of free templates and frameworks that should make it really easy for a lot of people to get started and get their hands dirty with content marketing without making a lot of the common mistakes and pitfalls that seem to lead to burnout on the road to content. So I’m excited for everybody to check that out and let me know what you think. James: Yup. So we’ll field questions or comments on this episode. I’m off to go and read that book. Kyle, it’s been just wonderful having you on the show. I would’ve got the book early but it’s only just come out at the time of recording. So fantastic, and I love what you’re doing with content marketing. You’re one of the good guys, and I appreciate how much you’ve come and shared with us. Kyle: Thanks for having me, James. It’s always an honor. It’s always an amazing time to be here. Thanks so much for everybody for listening to us.